If free camping a generator can be added to you hire. 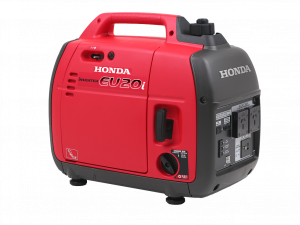 The Honda EU20i inverter generator can supply power for lighting, battery recharging and electronic equipment including computers and microwave cooking. This is an easy start unit and runs on standard unleaded fuel. The unit is equipped with 15amp electrical sockets suitable for the caravan power lead.